A supermassive black hole (SMBH) is the largest type of black hole, on the order of hundreds of thousands to billions of solar masses (M☉), and is found in the center of almost all massive galaxies. Supermassive black holes have properties which distinguish them from lower-mass classifications. First, the average density of a supermassive black hole (defined as the mass of the black hole divided by the volume within its Schwarzschild radius) can be less than the density of water in the case of some supermassive black holes. This is because the Schwarzschild radius is directly proportional to mass, while density is inversely proportional to the volume. Since the volume of a spherical object (such as the event horizon of a non-rotating black hole) is directly proportional to the cube of the radius, the density of a black hole is inversely proportional to the square of the mass, and thus higher mass black holes have lower average density. In addition, the tidal forces in the vicinity of the event horizon are significantly weaker for massive black holes. As with density, the tidal force on a body at the event horizon is inversely proportional to the square of the mass: a person on the surface of the Earth and one at the event horizon of a 10 million M☉ black hole experience about the same tidal force between their head and feet. Unlike with stellar mass black holes, one would not experience significant tidal force until very deep into the black hole. Donald Lynden-Bell and Martin Rees hypothesized in 1971 that the center of the Milky Way galaxy would contain a supermassive black hole. Sagittarius A* was discovered and named on February 13 and 15, 1974, by astronomers Bruce Balick and Robert Brown using the baseline interferometer of the National Radio Astronomy Observatory. They discovered a radio source that emits synchrotron radiation; it was found to be dense and immobile because of its gravitation. This was, therefore, the first indication that a supermassive black hole exists in the center of the Milky Way. Sagittarius A* is now thought to be a wormhole because it did not eat a dust cloud that traveled by it. The origin of supermassive black holes remains an open field of research. Astrophysicists agree that once a black hole is in place in the center of a galaxy, it can grow by accretion of matter and by merging with other black holes. There are, however, several hypotheses for the formation mechanisms and initial masses of the progenitors, or “seeds”, of supermassive black holes. The most obvious hypothesis is that the seeds are black holes of tens or perhaps hundreds of solar masses that are left behind by the explosions of massive stars and grow by accretion of matter. 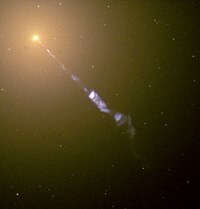 Another model involves a large gas cloud in the period before the first stars formed collapsing into a “quasi-star” and then a black hole of initially only around ~20 M☉, and then rapidly accreting to become relatively quickly an intermediate-mass black hole, and possibly a SMBH if the accretion-rate is not quenched at higher masses. The initial “quasi-star” would become unstable to radial perturbations because of electron-positron pair production in its core, and may collapse directly into a black hole without a supernova explosion, which would eject most of its mass and prevent it from leaving a black hole as a remnant. Yet another model involves a dense stellar cluster undergoing core-collapse as the negative heat capacity of the system drives the velocity dispersion in the core to relativistic speeds. Finally, primordial black holes may have been produced directly from external pressure in the first moments after the Big Bang. Formation of black holes from the deaths of the first stars has been extensively studied and corroborated by observations. The other models for black hole formation listed above are theoretical. Currently, there appears to be a gap in the observed mass distribution of black holes. There are stellar-mass black holes, generated from collapsing stars, which range up to perhaps 33 M☉. The minimal supermassive black hole is in the range of a hundred thousand solar masses. Between these regimes there appears to be a dearth of intermediate-mass black holes. Such a gap would suggest qualitatively different formation processes. However, some models suggest that ultraluminous X-ray sources (ULXs) may be black holes from this missing group. Computer model of a supermassive black hole is approximately what a person would see in reality made from equations of general relativity for the film Interstellar. Direct Doppler measures of water masers surrounding the nuclei of nearby galaxies have revealed a very fast Keplerian motion, only possible with a high concentration of matter in the center. Currently, the only known objects that can pack enough matter in such a small space are black holes, or things that will evolve into black holes within astrophysically short timescales. For active galaxies farther away, the width of broad spectral lines can be used to probe the gas orbiting near the event horizon. The technique of reverberation mapping uses variability of these lines to measure the mass and perhaps the spin of the black hole that powers active galaxies. 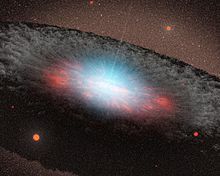 Gravitation from supermassive black holes in the center of many galaxies is thought to power active objects such as Seyfert galaxies and quasars. An empirical correlation between the size of supermassive black holes and the stellar velocity dispersion of a galaxy bulge is called the M-sigma relation. 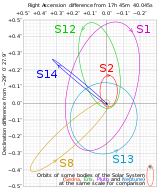 The star S2 follows an elliptical orbit with a period of 15.2 years and a pericenter (closest distance) of 17 light-hours(1.8×1013 m or 120 AU) from the center of the central object. The radius of the central object must be less than 17 light-hours, because otherwise, S2 would collide with it. In fact, recent observations from the star S14 indicate that the radius is no more than 6.25 light-hours, about the diameter of Uranus’ orbit. However, applying the formula for the Schwarzschild radius yields just about 41 light-seconds, making it consistent with the escape velocity being the speed of light. The Max Planck Institute for Extraterrestrial Physics and UCLA Galactic Center Group have provided the strongest evidence to date that Sagittarius A* is the site of a supermassive black hole, based on data from ESO’s Very Large Telescope and theKeck telescope. On 5 January 2015, NASA reported observing an X-ray flare 400 times brighter than usual, a record-breaker, from Sagittarius A*, a supermassive black hole in the center of the Milky Way galaxy. 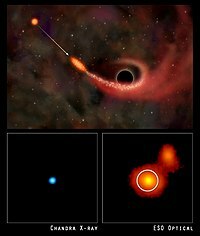 The unusual event may have been caused by the breaking apart of an asteroid falling into the black hole or by the entanglement of magnetic field lines within gas flowing into Sagittarius A*, according to astronomers. Supermassive black hole tearing apart a star. Below: supermassive black hole devouring a star in galaxy RX J1242-11 – X-ray (left) and optical (right). Unambiguous dynamical evidence for supermassive black holes exists only in a handful of galaxies; these include the Milky Way, the Local Group galaxies M31 and M32, and a few galaxies beyond the Local Group, e.g. NGC 4395. In these galaxies, the mean square (or rms) velocities of the stars or gas rises as ~1/r near the center, indicating a central point mass. In all other galaxies observed to date, the rms velocities are flat, or even falling, toward the center, making it impossible to state with certainty that a supermassive black hole is present. Nevertheless it is commonly accepted that the center of nearly every galaxy contains a supermassive black hole. The reason for this assumption is the M-sigma relation, a tight (low scatter) relation between the mass of the hole in the ~10 galaxies with secure detections, and the velocity dispersion of the stars in the bulges of those galaxies. This correlation, although based on just a handful of galaxies, suggests to many astronomers a strong connection between the formation of the black hole and the galaxy itself. The nearby Andromeda Galaxy, 2.5 million light-years away, contains a (1.1–2.3) × 108 (110-230 million) M☉ central black hole, significantly larger than the Milky Way’s. The largest supermassive black hole in the Milky Way’s vicinity appears to be that of M87, weighing in at (6.4 ± 0.5) × 109 (~6.4 billion) M☉ at a distance of 53.5 million light-years. On 5 December 2011 astronomers discovered the largest supermassive black hole in the nearby universe yet found, that of the supergiant elliptical galaxy NGC 4889, weighing in at 2.1×1010 (21 billion) M☉ at a distance of 336 million light-years away in the Coma Berenices constellation. Meanwhile, the supergiant elliptical galaxy at the center of the Phoenix Cluster hosts a black hole of 2.0×1010 (20 billion) M☉ at a distance of 5.7 billion light years. Black holes in quasars are much larger, due to their active state of continuous growing phase. The hyperluminous quasar APM 08279+5255 has a supermassive black hole with a mass of 2.3×1010 (23 billion) M☉. Larger still is at another hyperluminous quasar S5 0014+81, the largest supermassive black hole yet found, which weighs in at 4.0×1010 (40 billion) M☉, or 10,000 times the size of the black hole at the Milky Way Galactic Center. Both quasars are 12.1 billion light years away. Some galaxies, such as Galaxy 0402+379, appear to have two supermassive black holes at their centers, forming a binary system. If they collided, the event would create strong gravitational waves. Binary supermassive black holes are believed to be a common consequence of galactic mergers. The binary pair in OJ 287, 3.5 billion light-years away, contains the most massive black hole in a pair, with a mass estimated at 18 billion M☉. A supermassive black hole was recently discovered in the dwarf galaxy Henize 2-10, which has no bulge. The precise implications for this discovery on black hole formation are unknown, but may indicate that black holes formed before bulges. On March 28, 2011, a supermassive black hole was seen tearing a mid-size star apart. That is, according to astronomers, the only likely explanation of the observations that day of sudden X-ray radiation and the follow-up broad-band observations. The source was previously an inactive galactic nucleus, and from study of the outburst the galactic nucleus is estimated to be a SMBH with mass of the order of a million solar masses. This rare event is assumed to be arelativistic outflow (material being emitted in a jet at a significant fraction of the speed of light) from a star tidally disrupted by the SMBH. A significant fraction of a solar mass of material is expected to have accreted onto the SMBH. Subsequent long-term observation will allow this assumption to be confirmed if the emission from the jet decays at the expected rate for mass accretion onto a SMBH. In 2012, astronomers reported an unusually large mass of approximately 17 billion M☉ for the black hole in the compact,lenticular galaxy NGC 1277, which lies 220 million light-years away in the constellation Perseus. The putative black hole has approximately 59 percent of the mass of the bulge of this lenticular galaxy (14 percent of the total stellar mass of the galaxy). Another study reached a very different conclusion: this black hole is not particularly overmassive, estimated at between 2 and 5 billion M☉ with 5 billion M☉ being the most likely value. On 28 February 2013 astronomers reported on the use of the NuSTAR satellite to accurately measure the spin of a supermassive black hole for the first time, in NGC 1365, reporting that the event horizon was spinning at almost the speed of light. In September 2014, data from different X-ray telescopes has shown that the extremely small, dense, ultracompact dwarf galaxy M60-UCD1 hosts a 20 million solar mass black hole at its center, accounting for more than 10% of the total mass of the galaxy. The discovery is quite surprising, since the black hole is five times more massive than the Milky Way’s black hole despite the galaxy being less than five-thousandth the mass of the Milky Way. Some galaxies, however, lack any supermassive black holes in their centers. Although most galaxies with no supermassive black holes are very small, dwarf galaxies, one discovery remains mysterious: The supergiant elliptical cD galaxy A2261-BCG has not been found to contain a supermassive black hole, despite the galaxy being one of the largest galaxies known; ten times the size and one thousand times the mass of the Milky Way. There is not yet any explanation for this; no traces of any X-ray source are found in the galaxy’s center, however the discovery may imply that not all massive galaxies generally contain an SMBH, and the size of the galaxy does not correlate the size of the central black hole in some cases.